George Butchard is a Russian literary translator and journalist with a lifelong passion for Russian literature. Born in the UK, he studied at Warwick University and holds both a BA and an MA in English & World Literature, writing his thesis on Mikhail Bulgakov’s “The Master and Margarita.” In this blog, George will answer your questions about Russian literature. 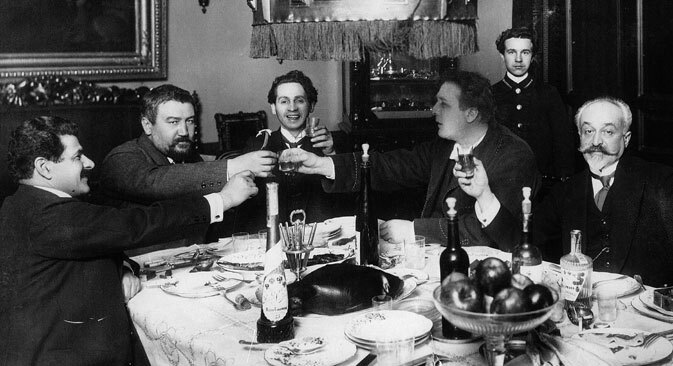 A question from reader: What did Russian writers eat? Did any of them have any particular tastes? Classical Russian writers were producing their work before globalization, so they wouldn’t have had the same range of food that we do. I like the image of Dostoevsky tucking into a plate of sushi, but unfortunately this can’t have been the case. In fact, when it comes to Dostoevsky in particular, this idea really is fantastical, given the struggles he faced in his life. He was in a Siberian prison camp from 1849 to 1854, and we can safely assume that he didn’t have access to haute cuisine there. We get an insight into conditions in Siberia through his character Raskolnikov, who is given “thin cabbage soup with beetles floating in it” to eat. Dostoevsky’s culinary life wouldn’t have started off nearly this bad, though. He was from a middle class family, so during his early days he would have eaten food that was representative of this sector of society: soups made with meat, vegetable and grains (famous examples are borsht, a hearty beetroot-based soup, shchi, a cabbage soup, and solyanka, a spicy meat soup), buckwheat, pancakes and dumplings filled with meat or vegetables, depending on his family’s income at various times. It was in this environment, “burning with some kind of inner fever” that he wrote his great novel Crime and Punishment. So food – or rather lack of it! – played a role in giving us one of the most renowned novels in the Russian literary tradition. Tolstoy is definitely the most famous Russian writer for his particular diet, as he was a vegetarian. He turned gave up meat in 1885 as part of his ongoing ethical and spiritual development, writing: "If a man's aspirations towards a righteous life are serious … if he earnestly and sincerely seeks a righteous life, his first act of abstinence is from animal food, because, not to mention the excitement of the passions produced by such food, it is plainly immoral, as it requires an act contrary to moral feeling, i. e., killing - and is called forth only by greed." From this point on he lived on a very simple diet consisting of nuts, fruit, vegetables and porridge, quite out of keeping with what would have been expected of him as a nobleman. Alexander Pushkin, however, would most likely have eaten the refined food typical of the nobility in St. Petersburg at the time. This would have included dishes such as minced pike served with caviar, smoked duck, and French-style escalopes. St. Petersburg was the most European city of the day, so there would also have been imported German, Italian and Dutch dishes available there too. If you’re familiar with Russian cuisine at all, then you will definitely have heard of Salad Olivier, which usually contains potatoes, carrots, peas, eggs, chicken and various other option ingredients, but, although Dostoevsky may have encountered it in St. Petersburg, Pushkin wouldn’t have done, as it was only invented in the 1860s – some two-and-a-half decades after he died. And, as a final note in terms of Russian writers’ culinary legacy, if you have a morbid streak you can go to the café where Pushkin ate his last meal before he fought his fatal duel: Literary Café in St. Petersburg, which is located at the corner of Nevsky Prospekt and the Moika, no more than five minutes walk from the Hermitage.